Last night I stitched with everyone over at Wendy's - what fun! I didn't get as much done as I'd hoped though. I'd been awake since Thursday, met my mom and aunt for dinner, grocery shopped, and bought and installed a toilet seat. I was MORE than ready to sit down in my comfy chair, put my feet up, and pick up my needle and floss! Not nearly as far as I'd hoped. Maybe I'll get a lot further today! 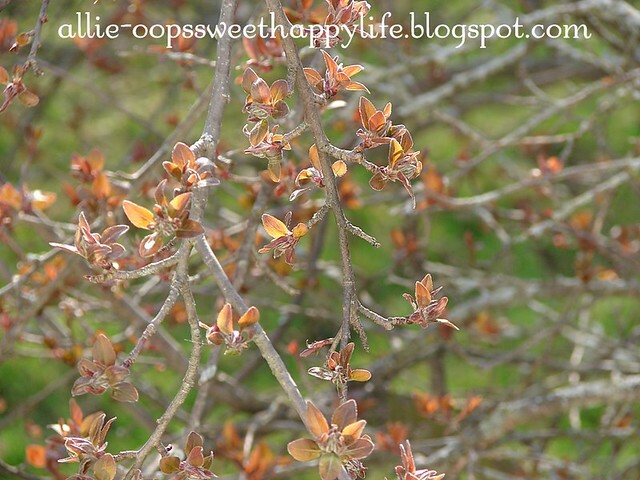 There are some signs of spring here in Michigan, lots of buds on my crabapple tree outside my window - the pink blooms are what I look forward to every year! Every tree has buds, it's 9am and already 65F - although next week will be chilly, I do have reason to hope for warmer days. I'm going to pop over to Wendy's and see what everyone else got up to last night! That's such a sweet embroidery! Yes, the weather is starting to get springish - my peony bush is starting to peek out of the ground, and so are my lilies ... although I see something digging around the lily buds so I hope they're going to be OK. We're getting some warm days but then the temps drop again - there's actually wet snow in the forecast for later this week, so we're not done with the crud yet! I think you got quite a bit done. Will you be framing it? You do the nicest embroidery stitch. 65F, we have Celsius, so you are warm even by our temps in spring time, about 17.5C, time to bring out a T shirt and shorts. Your stitching is lovely, super shade of thread. What a gorgeous stitchery!! The saying is really lovely. Why is it we never get as much done as we think we will. Glad to hear Spring is getting there. We're in the Smokies for a couple of days, and we've been photographing more wildflowers than I've ever seen. Love your stitchery!!! Such a sweet stitchery! Nice to see signs of spring too! Oh Allie, It's gorgeous !!!! AThat's a very sweet little stitchery...we are heading to autumn of course but since I live in almost tropical Brisbane autumn is still warm and winter barely makes an appearance - I'm looking forward to the cooler weather. Glad you decided to join in FNSI - hopefully see you again. Such a pretty stitchery. I also love seeing the new spring growth it gives me hope for warmer weather ahead although I am on the other side of the world and now going into autumn hence my Sunbonnet Sue in her autumn outfit. 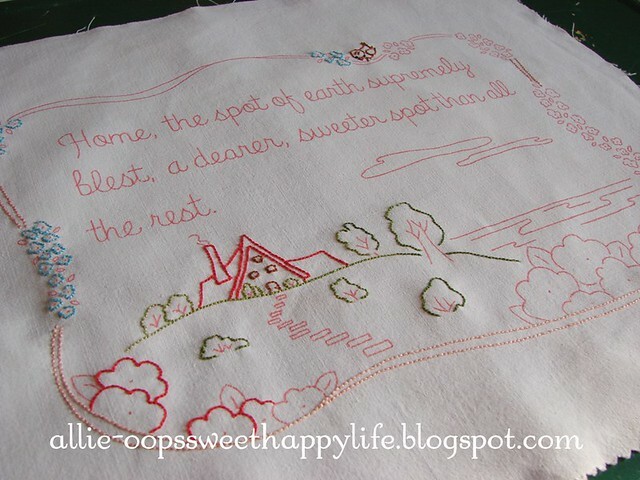 such a sweet new embroidery pattern. you are so creative. Some is better than none, right? =) I love that design. I hope your crab apples are bursting this week and there's no freeze in that chilliness! Gorgeous stitchery and such a lovely sentiment. So true! I love the sneak peek of your new embroidery design, very pretty :) Barb. Beautiful stitchery..so nice to see the spring weather coming! It's Autumn here . My favorite season. Warm days and cool nights. Your stitchery block is lovely - such a beautiful design....Our temperatures are cooling off and the trees are starting to loose their leaves! Pretty in a different way to you! I am loving your stitchery! So sweet.